How Do I Know Whether or Not I Get Covered by Workers’ Compensation? wwo Let’s assume that you’re working at your job and, because of the negligence of others, you are injured or become ill. What can you do, and where do you turn? Becoming ill or injured on the job may make you eligible for workers’ compensation benefits, which is an insurance program that is required by state law for all employers. The Employer Must be Covered by Workers’ Compensation: An employer’s responsibility to provide coverage usually depends on how many employees it has, what type of business is run, and what type of work takes place there. The vast majority of employers are required to carry coverage and you will want to double-check this with an attorney you can trust. You Must be an Employee: Not all workers are seen as employees when it comes to receiving benefits. This can include independent contractors (see below) and volunteers in some cases. The Injury or Illness Must be Work-Related: If you were doing an act for your employer and became injured or ill as a result, then you are most likely covered by workers’ compensation. However, in some situations this may not be true; let’s consider a situation where you are on break and become injured picking something up for your boss. Yes, this situation may have had some connection to your job, but will you be covered? You may need an attorney’s help finding out (DelPo). What is an employee? 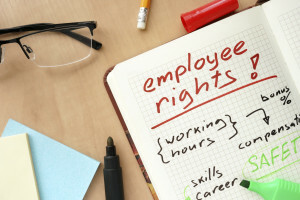 An employee is someone who works under the direction and control of an employer, performs the regular business of the employer, uses tools provided by the employer, has a long term position with the employer, and has taxes taken out of his or her paycheck by the employer. On the opposite end, an independent contractor varies greatly. He or she uses their own tools, does not have taxes taken out by their employer, could be hired to perform one task, and is not necessarily performing the employer’s regular business. You must ask yourself: Who controls the details of the work? An employer will have the authority to tell an employee exactly what to do, but an independent contractor does not have to be told how to perform the job. In some cases, an employer might not carry the insurance they legally should. It is vital to note that all employers are actually required to have either workers’ compensation insurance or be self-insured. If they aren’t, you have the right to sue your employer or you can choose to file a workers’ compensation claim with your state’s special fund for handling uninsured workers’ compensation claims. Your best bet is to contact a workers’ compensation lawyer (Goguen). Workers’ compensation laws vary from state to state, which is why it is beneficial for you to speak to an experienced attorney. RAWA Law Group located in Los Angeles has specific experience dealing with workplace accident injuries and what you can expect from them. Call today for a free consultation, call us at 844-444-1400 . If I am Receiving Workers’ Compensation Benefits But Return to Work, Do I Still Get to Receive Those Benefits or do I Lose Them?